One of the items I stopped buying this year was the loaf of bread. Over the past 3-4 years, it was featuring regularly in my weekly grocery shopping. Though I’m not a fan of bread toast and sandwiches, my husband and daughter loved to eat a slice or two with jam or peanut butter. We would invariably waste nearly half the pack every week since it would have gone past the expiry date. We stopped buying it primarily because of the wastage. There are so many variants of bread available in the market. Milk bread and sandwich bread are made of 100% maida. Many of us buy whole wheat bread or brown bread on a regular basis, thinking that we are making a healthier choice for ourselves. But is brown bread actually healthy? The best way to check is to look at its ingredients. Here’s a brown bread pack from “Daily Bread”, one of the popular brands in Bangalore. Brown bread has ONLY 32% of whole wheat flour and the rest is refined wheat flour or maida. All packaged foods are made of palm oil, which is one of the cheapest edible oils that is bad for our health, environment and economy. Called as Calcium propionate, a natural acid that acts as an antimicrobial preservative in food products, especially in bakery. It helps in the prevention of mold formation and extends shelf life. Linked to headaches, migraine, asthma and also aggravates food intolerances. Amylase - Helps to break down complex starch found in flour. Causes the bread to rise. Derived from mould mushroom or pig pancreas. Amylase occurs naturally in yeast and so I’m not sure why there is a need to add it separately as well. 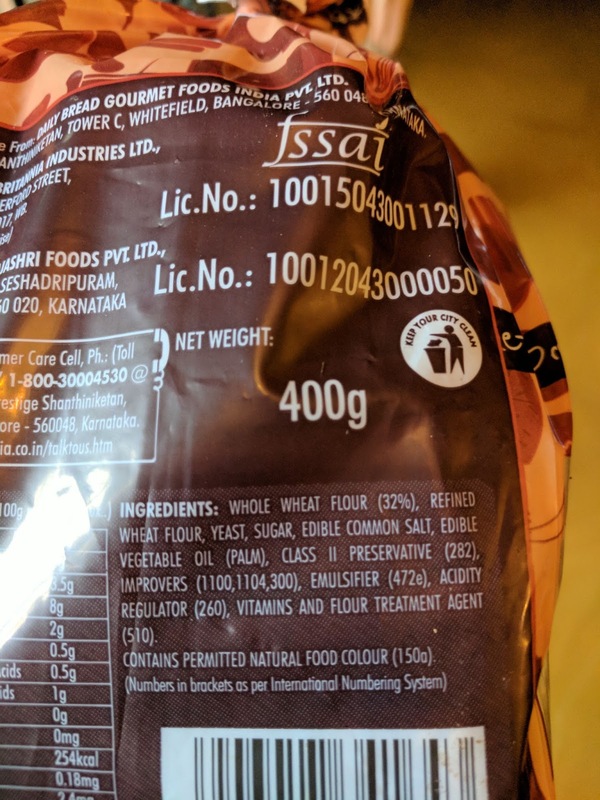 Lipases - it is used as an emulsifier and processing aid in the breakdown of fats and oils, and as a flour treatment agent in baked goods and bakery products. L-ascorbic acid. It is an artificial additive that helps to retain gas in the dough, which makes the loaf rise more. Diacetyltartaric and fatty acid esters of glycerol. Obtained from either soybeans (possibly GMO) or pork. Helps to control the acidity or alkalinity, so the required pH level can be maintained which prevents the growth of bacteria in the product. The main side effect of this additive is that it can trigger asthma. Large amounts can cause acidosis - nausea, headaches, insomnia. Caramel colour - so now we know what gives the brown bread the “brown” colour. 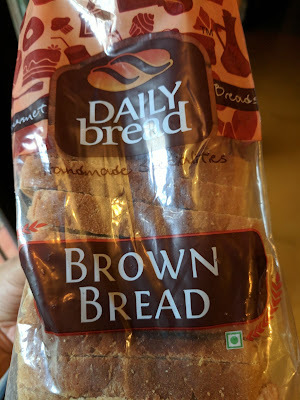 Looking at these long list of ingredients, Brown bread sounds as unhealthy as a pack of cookies or any other junk food. If you like to eat bread on a regular basis, it is much safer to bake it at home. I have baked bread at home a couple of times…All I had to use was flour (a combination of maida and wholewheat flour), yeast, little sugar, salt and little oil. No chemicals/additives are needed. Given the number of issues that arise out of excess gluten consumption, the best option would be to avoid bread completely and switch to other healthy breakfast/snack alternatives. Hi. Am from processed food industries for over 50 years. I read your views on various items. While I agree with some of the views expressed a proper comp would have been to give details of white bread ingredients. I always advise my friends n children in US to look for ingredients n not be carried away by misleading ads from manufacturers specially in this part of the world. This is a commercial industry -period. Amudan . Thank you Amudan for sharing your views. As you rightly said, it is a commercial industry with profit motives. All the health claims that are being advertised need to be investigated before purchase. I'll do a separate writeup comparing the ingredients of various types of bread available in India. Agreed it's a commercial industry. They can come up with n number of products and advertise them but should not claim to be healthy when they are not. Thank you so much for sharing ur analysis report, I used to notice manf date and exp. date thinking that brown bread is best over others. Every day I add bread in the kids lunch box now I should seriously think. I am Thank full to you for sharing such an informative article, this should reach every parents to build a healthy generation. Life today is not to live.... But to die.